When I first visited this church in 2005, it was with something of a sinking heart to arrive at the third church in a row that was locked without a keyholder notice. Today, nothing could be further from the truth. 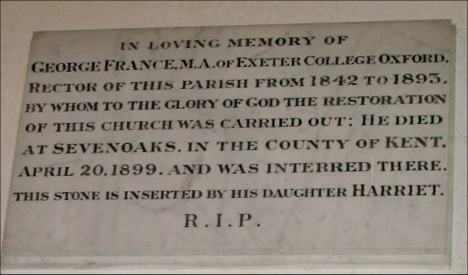 In the south porch there is a large notice now which reads Come in and enjoy your church! Fabulous stuff. The trim graveyard includes some substantial memorials to the Kay family, including one massive structure with an angel under a spire which would not look out of place opposite the Royal Albert Hall. No expense was spared by the Victorians here at Brockdish. 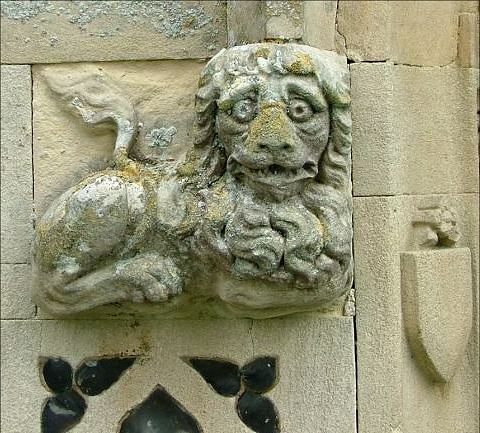 The rebuilding was paid for by the Rector, George France, who also advised architect Frederick Marable on exactly what form this vision of the medieval should take. 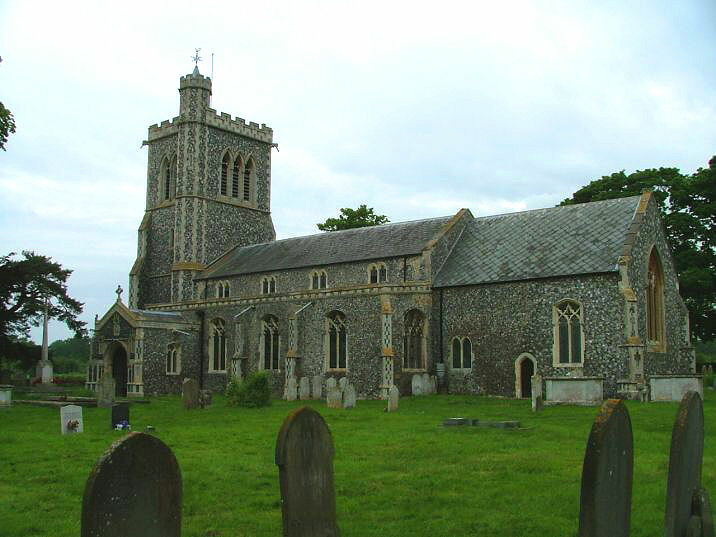 The tower above is curiously un-East Anglian, looking rather unusual surrounded by Norfolk fields. 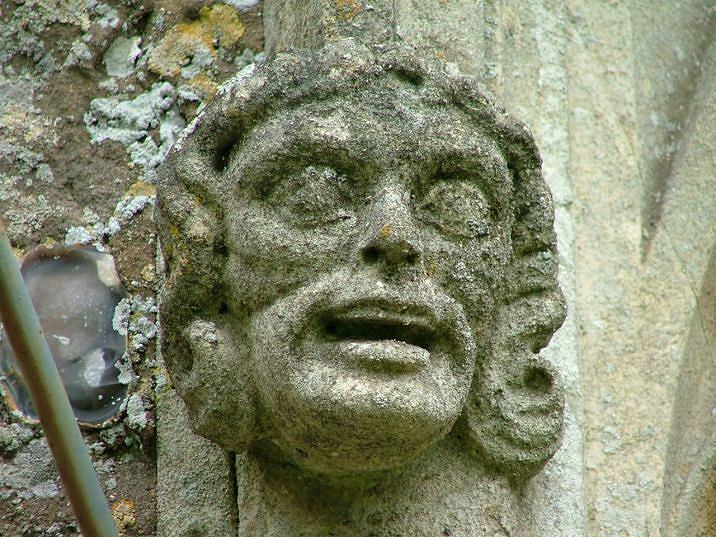 All around the building headstops are splendid, and fine details like faux-consecration crosses on the porch show that France was generally a man who knew what a medieval church should look like. It will not surprise you to learn that St Peter and St Paul is similarly grand on the inside, if a touch severe. France actually devised a church much more Anglo-catholic than we find it today; it was toned down by the militantly low church Kay family later in the century. 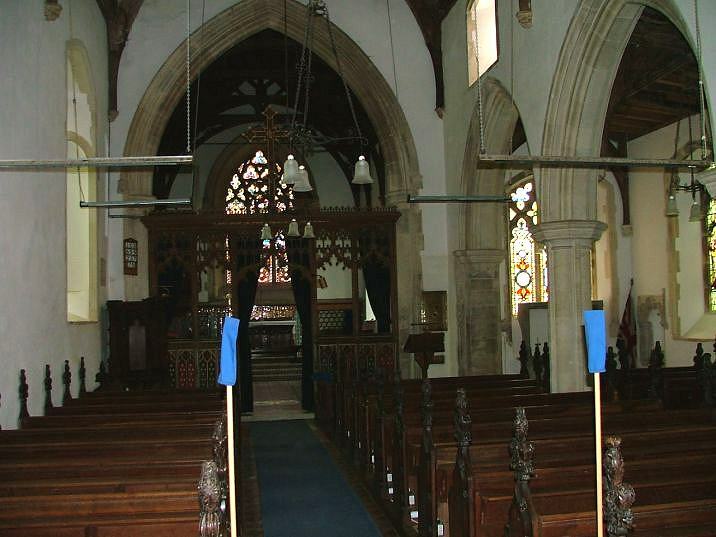 They took down the rood and replaced it with a simple cross, painting out the figures on the rood screen as well. When I first visited, the very helpful churchwarden who'd opened up for me observed that Brockdish is the only church in Norfolk that has stained glass in every window, which isn't strictly true (Harleston, three miles away, has as well) but we can be thankful that, thanks to the Reverend France's fortunes, it is of a very good quality. The glass seems to have been an ongoing project, because some of it dates from the 1920s. In keeping with low church tradition, the glass depicts mainly Biblical scenes and sayings of Christ rather than Saints, apart from the church's two patron Saints in the east window of the chancel. 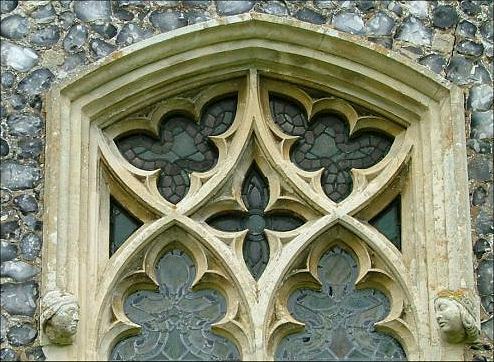 There are also some roundels in the east window of the south aisle, which appear to be of continental glass. They depict the Adoration of the Magi, the deposition of Christ, what appears to be Paharoah's daughter with the infant Moses, and the heads of St Matthias, St John the Evangelist, and Christ with a Crown of Thorns. However, I suspect that at least some of them are the work of the King workshop of Norwich, and that only the Deposition and the Old Testament scene are genuinely old. If this is rather a gloomy church on a dark day, it is because of the glass in the south clerestory, a surprisingly un-medieval detail - the whole point of a clerestory was to let light reach the rood. The glass here is partly heraldic, partly symbolic. 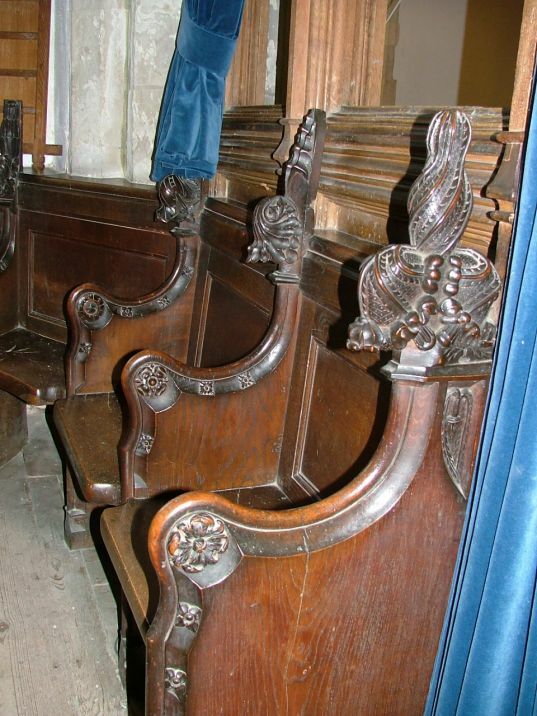 The stalls in the chancel are another faux-medieval detail - there was never a college of Priests here - but they looked suspiciously as if they might contain old bench ends within the woodwork. Not all is false, because the chancel also contains an unusual survival from the earlier church, a tombchest which may have been intended as an Easter Sepulchre. 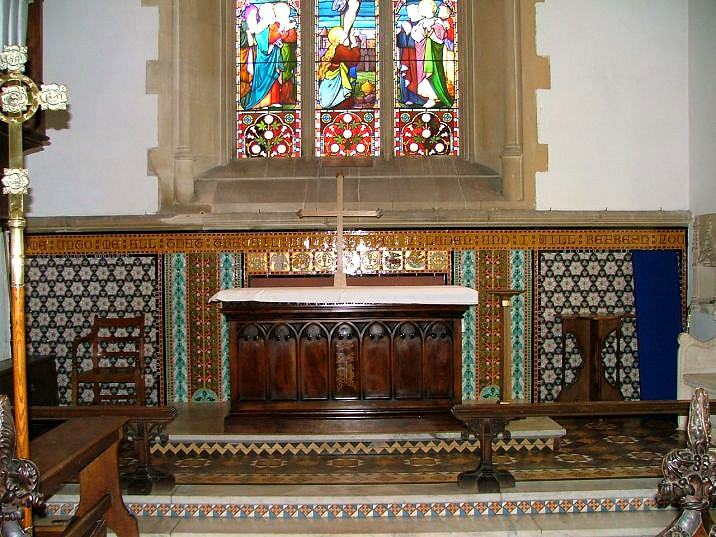 Above all, the atmosphere is at once homely and devotional, not least because of the exceptional quality of the tiled sanctuary, an increasingly rare beast because they were so often removed in the 1960s and 1970s, when Victorian interiors were unfashionable. Brockdish's is spectacular, a splendid example that has caught the attention of 19th century tile enthusiasts and experts nationally. 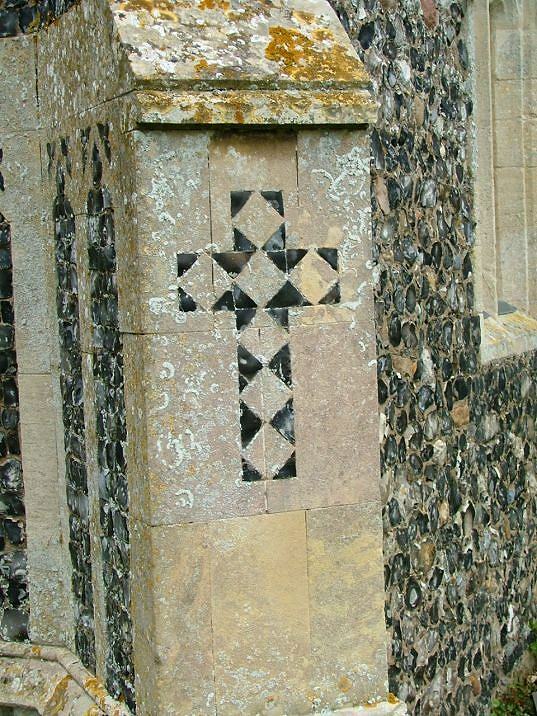 Also tiled is the area beneath the tower, which France had reordered as a baptistery. The font has recently been moved back into the body of the church; presumably, whoever supplies the church's liability insurance had doubts about godparents standing with their backs to the steps down into the nave. I liked Brockdish church a lot; I don't suppose it gets a lot of visitors, but it is a fine example of what the Victorians did right.